If you want a way to store and display your books, but you don't have room for a bookcase, build and install floating shelves. Floating shelves are mounted to the wall with the use of a cleat that the shelf slides over, giving the appearance that the shelf is floating because the support structure isn't visible. One shortcut you can take when building floating shelves is using hollow-core doors for the shelves. Floating shelves get their name from their seeming ability to float. Find the studs in the wall where the shelves are being installed, using a stud finder. Mark the location of the studs and draw a line to connect the marks. Use a level to draw the lines to ensure the shelving will be straight. Cut an 18-inch hollow-core door in two lengthwise with a circular saw equipped with a 40-tooth carbide blade. Stain the door panels, or apply primer and paint, and allow them to dry. Measure the inside edges of the door panels. Cut a 2-by-4 for each shelf that matches the inner dimensions of the panels. The boards will be the cleats that the shelves hang on. Hold the cleat against the wall with the top edge positioned against the line you drew. You may want the help of an assistant for this. Drill 1/8-inch pilot holes through the cleats and into the studs. Drive a lag screw through each hole in the cleat and into the studs with a drill or adjustable wrench until the screw is tight. Remove about 1 1/2 inches of the cardboard core inside the doors by scraping it away with a wood chisel. Slide the shelves onto the cleats to check the fit. 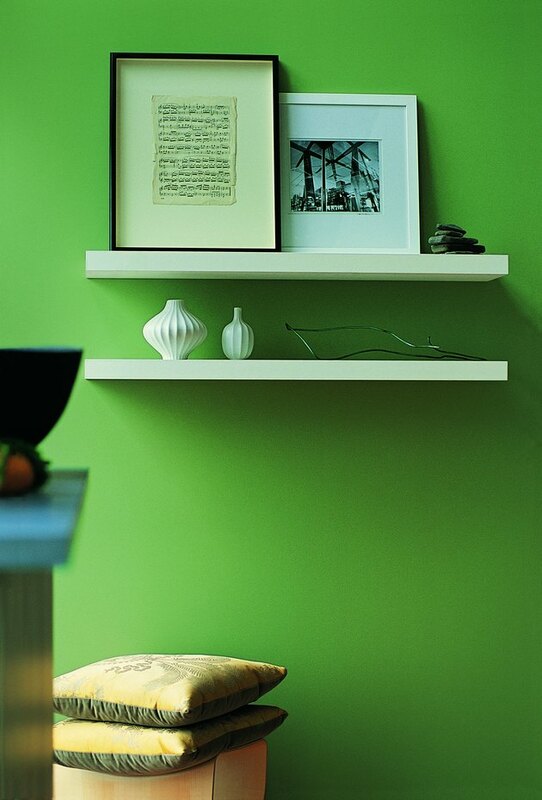 If necessary, trim the shelving so it fits directly against the wall. Apply carpenter's glue to the bottom inside edge of the doors and the top of the cleats. Slide the doors onto the cleats. Place a framing square on top of the doors and lift the doors. Drive 1-inch brad nails through the doors and into the studs every 8 inches. Again, you may want to recruit an assistant for this step.